As you approach the crest of Typnahda Mountain from the west you may catch a glimmer of the light’s reflection coming from the woods. Pull into the parking area and take but a few steps down the gently curving path and you will see our wonderful historic cabin. Wander around the exterior of the cabin and observe slate walkways and an antique compass arrow embedded into a paving stone. The surrounding forest edge is graced with abundant wildflowers in spring and provides shelter for birds and other wildlife year-round. 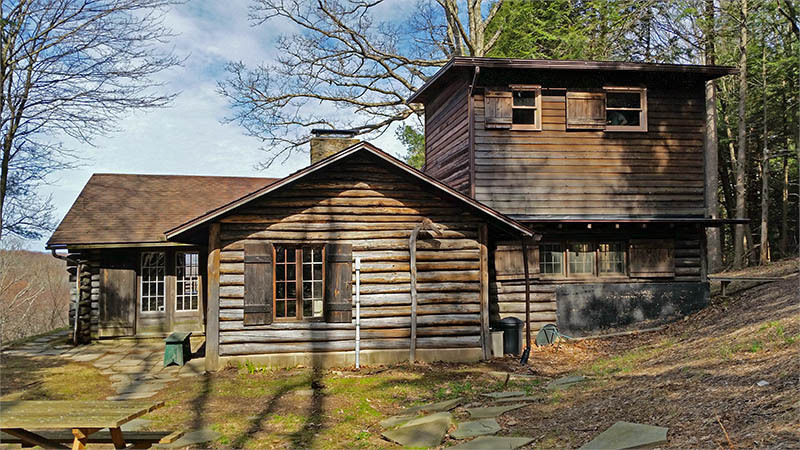 Located in a rustic setting on a man-made plateau with an unparalleled view of the valley and hills to the west, the Pfeiffer-Wheeler family America Chestnut log cabin was constructed between 1939 and 1941 on Lillibridge Road to provide the family a summer retreat where they could enjoy this beautiful spot. The log cabin has strong visual references to traditional great camp notions of the late 1800’s. The floor plan is a symmetrical T with a great room across the front, taking advantage of the spectacular view to the west. Enter the great room and step into a glimpse of the past. Most of the family’s furnishings from the 1940’s are intact. The room has a beautiful open gabled pine ceiling and walls of untreated chestnut. A large oversized rustic fireplace constructed of fieldstone from the property anchors the great room. The floor is constructed of slate that came from the Village of Portville. Gaze through the large picture window on a vista that spans twenty-two miles to Allegany State Park. The cabin and site were listed in the National & State Registers of Historic Places in January 2002 in recognition of its significance in American history and culture.